BERLIN (Reuters) - Support for Germany's Social Democrats (SPD) has hit its highest level in almost six months, a poll showed on Sunday, a week after the center-left party outlined new welfare plans aimed at winning back working class voters. Ahead of European elections in May and four regional votes this year, the Emnid poll for the Bild am Sonntag newspaper put support for the SPD, which shares power with German Chancellor Angela Merkel's conservatives, on 19 percent, up 2 points from a week ago. That was the highest level since the start of September and put them in second place for the first time since October, above the environmentalist Greens who dropped 2 points to 15 percent. Merkel's conservative bloc was unchanged on 30 percent. The far-right Alternative for Germany (AfD) was also unchanged, at 13 percent. The poll offers a rare sign of hope for the SPD after it in 2017 suffered its worst federal election performance since 1947. It subsequently lost even more ground largely because it agreed to share power again with Merkel, say experts. It hit a low of 14 percent in an Emnid poll in November. 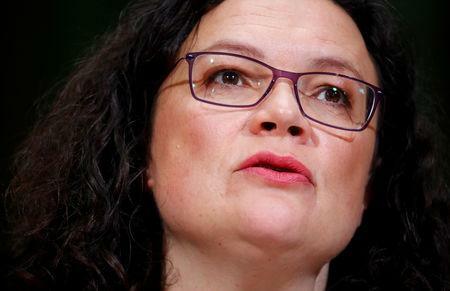 In an effort to win back traditional supporters angry about compromises made with the conservatives in government, the SPD last week unveiled plans to make unemployment benefits and pensions more generous.